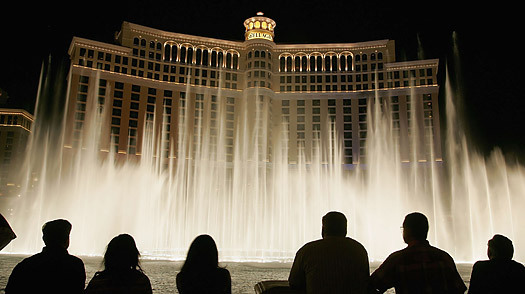 People stare at lots of free shows outside the hotels, but there's only one worth going to: the Bellagio fountains. Every half-hour between 3 p.m. and 8 p.m., and every 15 minutes from then 'til midnight, an 8.5-acre lake in the middle of the desert explodes with 1,214 spritzers shooting water up to 460 feet in the air  the water rockets and dances, perfectly choreographed to Frank Sinatra or Gene Kelly or "One Singular Sensation" from A Chorus Line. And yet, for some reason, it doesn't feel all that gay, which is quite a feat. Las Vegas Guide: Find travel deals, hotels and more!